Military prosecutors intend to pursue more serious charges against Pfc. 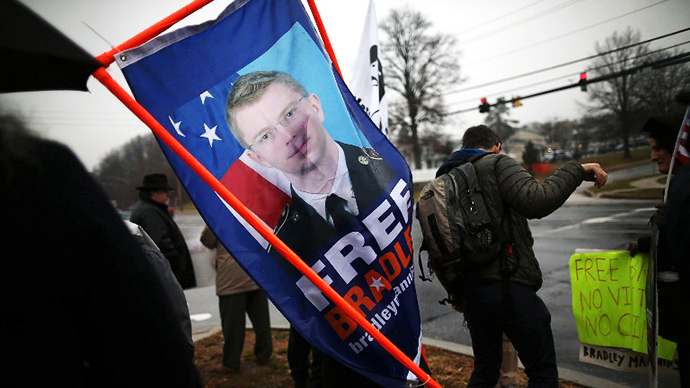 Bradley Manning despite his having plead guilty to lesser charges. The whistleblower faces life imprisonment if he is found guilty of aiding the enemy. 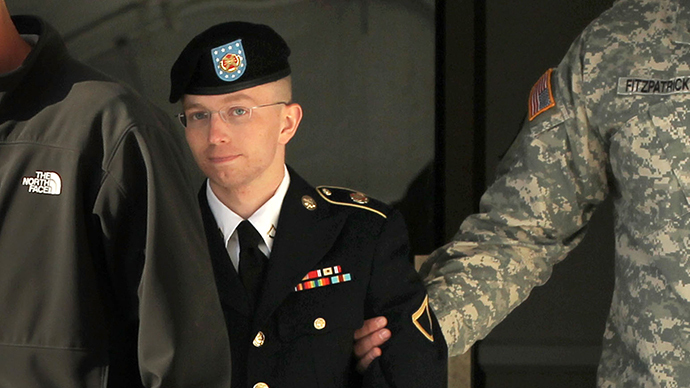 Manning, 25, admitted on Thursday to handing over a trove of classified documents to WikiLeaks. He voluntary plead guilty to 10 relevant charges, carrying a maximum sentence of 20 years. The move was a 'naked plea' – unlike a plea bargain, there is no arrangement with the prosecution to drop other charges. It did, however, give prosecutors the option to only purse the charges to which Manning confessed, and proceed straight to sentencing. But after the judge accepted the plea, military prosecutors announced they would pursue the 12 other charges, including the rarely used indictment of aiding the enemy. The crime is punishable by the death sentence, but the prosecution earlier ruled that out, saying they would seek life in prison without parole. “Given the scope of the alleged misconduct, the seriousness of the charged offenses, and the evidence and testimony available, the United States intends to proceed with the court-martial to prove Manning committed the charged offenses beyond the lesser charges to which he has already pled guilty,” a statement from the Washington Military District said. The court martial will begin on June 3, with 141 prosecution witnesses scheduled to testify. The prosecutors reportedly plan to reveal that some of the documents leaked by Manning were found by the Navy SEAL team that raided Osama Bin Laden’s hideout in May 2011. Manning’s plea appears to give him little advantage in the trial, apart from probably winning some points from the judge, Col. Denise Lind, for not forcing the government to prove his role in the leak and his breaking the law in the process. But there may be more strategic consideration, explained Michael Navarre, a former Navy judge advocate and military justice analyst. "He's laying the groundwork for a more lenient sentence and laying the groundwork for a potential defense to the aiding the enemy and the espionage charges," Navarre told AP. "You end up with a more reasonable starting position — 'I admit I did it, but I didn't think it was going to harm anyone.'" 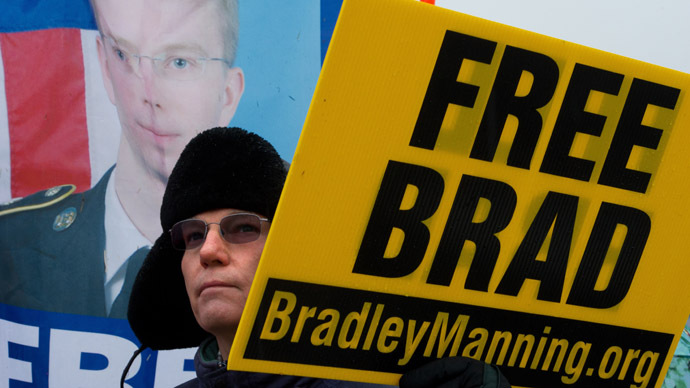 Manning has many supporters, who see him as a hero for putting his well-being on the line to expose morally questionable secrets of the US government. 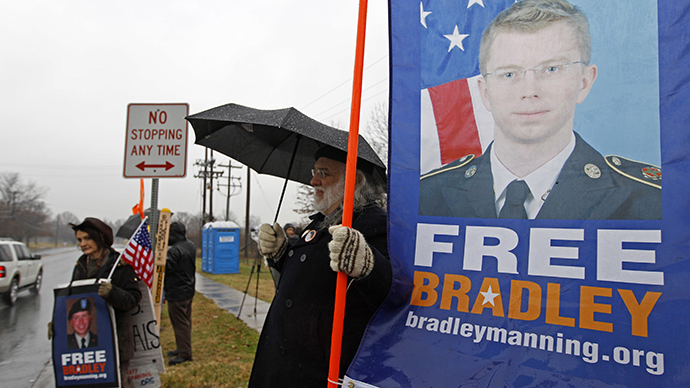 The Bradley Manning Support Network has raised more than $900,000 for his defense. A vigil in his honor was held in front of the US embassy in London on Friday. The case could set a worrisome precedent for free speech: Manning’s alleged crime of aiding the enemy constitutes publishing classified documents on the Internet, allowing enemies of the US to read them. A guilty sentence would mean that any leak of government secrets that ends up on the Internet, event through traditional media, could be subjected to similar charges.